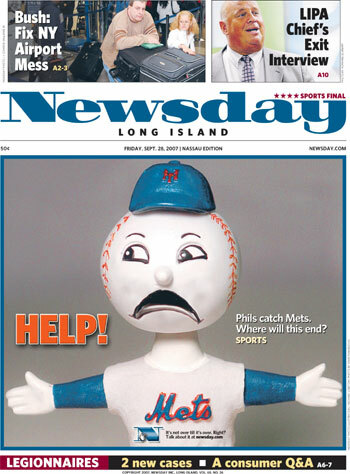 The team had been alone in first place every single day since way back on May 16th, had a seven game lead as recently as September 12th--with 17 to play--and now, with a mere three games left in the regular season, the Mets are in a dead even tie with the Phillies. Boy, it's a good thing Conan O'Brien demonstrated a few weeks back that Mr. Met can't fit that oversize noggin of his through either a noose or into an oven, or else the Phillie Phanatic would very likely have attending a funeral on his itinerary. As long as it doesn't clash with any victory parades, I suppose. 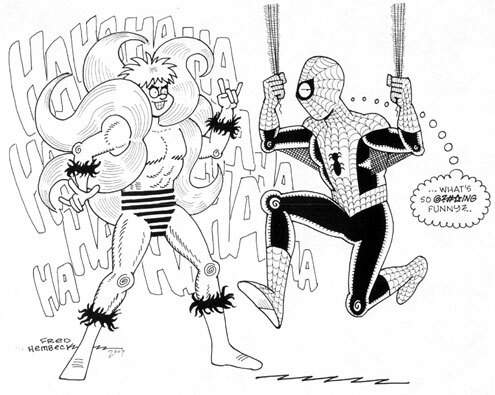 Pretty much like all the rest of you, I took the opportunity this past weekend to watch that wonderful new BBC documentary, "In Search of Steve Ditko" (thank you, Mark Evanier!). The description of the Creeper. His most notable super-power, apparently, was the ability to laugh at will! Y'know, I never quite thought of it that way, but that's pretty much on the money! 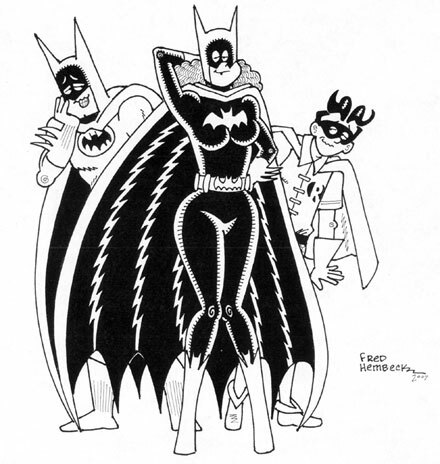 WHY did I decide to draw Batgirl (and a pair of her masked admirers)? Hey, it's Batgirl--ain't that reason enough?.. And yes, friends, put your bids in for the eBay auctions of each via these links: Creeper/Spider-Man; Superman and his Family; and Batgirl and Friends. Comics-oriented websites seem to be sprouting up these days like, well, weeds. ...not when you call yourselves "Comic Vine", at least! But hey, you're probably wondering WHY I'm telling you this anyway, huh? Simple--the fine folks over at Comics Vine (hi Tony!) recently requested an interview with yours truly, one which I happily granted. You can read the email exchange by going here. Worry not --it's only of moderate length. Besides covering a bit of quasi well-known Hembeck history, you'll also learn of my most unsettling commission, whose side I favored in the "Civil War", and my favorite movie experience of the past summer! And if that's not enough to send you immediately off the check out the Q&A, the whole thing is topped visually with a commissioned illo of the, um, rather buxom lady above (as well as the aforementioned Tony), whose coif would surely give Medusa a run for her money! Thanks for the moment in the spotlight, Comics Vine! Your site is a whole lotta fun! In fact, you could say it's growing on me! I'm no sap--I'll be rooting for you all the way!.. I recently had the sheer unadulterated pleasure of reading the AMAZING SPIDER-MAN OMNIBUS, reacquainting myself with stories I hadn't given more than a cursory glance to in decades! 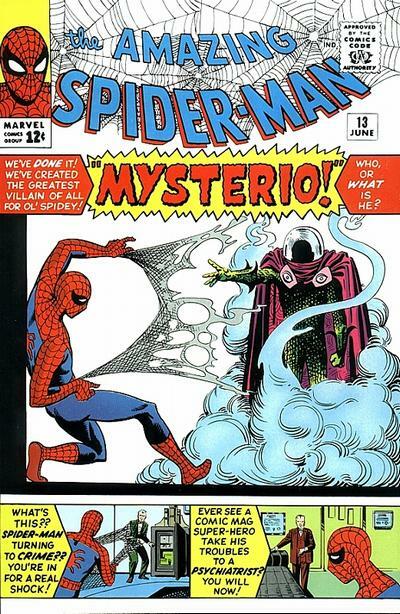 One of my very favorite issues was lucky number thirteen, which introduced Mysterio to the Marvel Universe. 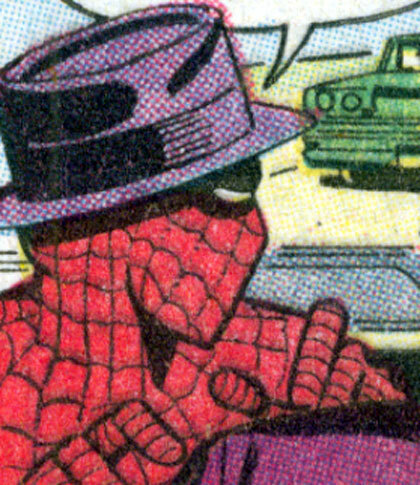 I'd remembered that yes, Mysterio disguised himself as our hero early in the tale, committing robberies to sully Spidey's already questionable name--and then came along and beat the ol' webhead, all to great public acclaim! 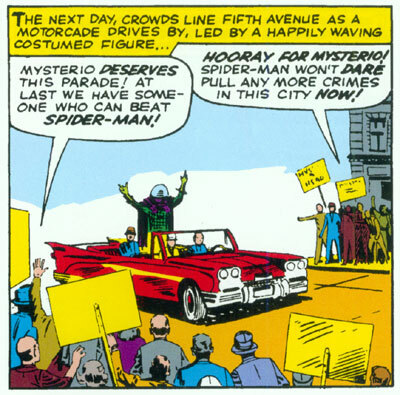 A parade for Mysterio!! How very, very DC of Stan and Steve! Well, it WAS 1964 y'know--not ALL the rules had been rewritten yet. For a guy with a name like Mr. Fantastic, I don't think he's ever looked quite as smugly superior as he does here, y'know? (Except maybe for that time he informed Namor that Sue was marrying HIM--and then told the Sub-mariner not to worry cuz (heh) he of all people should know there are other fish in the sea...)..
On the other hand, this cover makes no real sense! 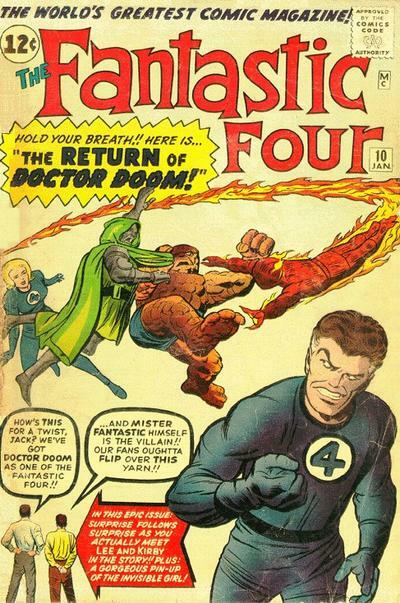 Yes, Dr. Doom has switched minds with Reed Richards, unbeknownst to his three teammates, but even taking into account that this is a purely symbolic scene, WHY are the non-flying Doctor and Thing engaging in a squabble in the sky, while the otherwise land bound Sue Storm floats tremulously nearby? The Torch CAN fly, true, but he doesn't even seem to be actively involved in the scuffle, just passing by! And our good friends, Stan and Jack--they appear to be looking up at the ill-conceived action, but notice the scale--the Invisible Girl looks big enough to stuff The King in her side pocket! Well, maybe that's a bit extreme, but if there had been a casting call for Munchkins later that afternoon, the Lee and Kirby pictured above would surely have gotten the gig! But I still love that crazy, nutty, wacky cover, and you can see my own crazy, nutty, wacky version by going here! Considering how the comics that Stan, Jack, and Steve--among many other talented cartooning folk--managed to leave such a lasting--and at times, profound--impression on me when I was a wee lad growing up, I suppose it shouldn't come as all that big a surprise that some of the stuff I cranked out myself years back has had a similar effect on readers coming of age at the time. But it does. Surprise me, that is. Over on MySpace, I'm beginning to understand just how popular MARVEL AGE magazine was, as I seem to hear nice things from eighties era purchasers of said publication on a fairly regular basis. 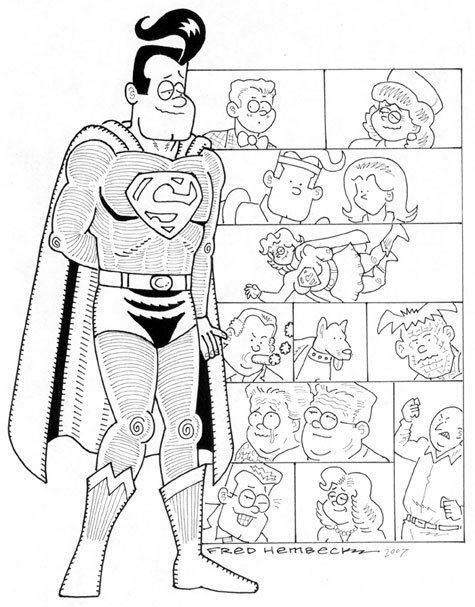 One fellow really caught my attention, though, when he sent me a message proclaiming the strip I did for the "A Day In The Life Of Marvel" issue as being his all-time favorite! Now, this pretty much floored me, because that particular strip was far, FAR from being my own personal fave, trust me! As always, Jim Salicrup put together a great issue, doing a swell job of adhering to the stated theme, y'see, and he asked me to devote my two page centerspread to a day in my own life! Well, you can just imagine the amount of excitement THERE!! For fifteen panels (fourteen pantomime, and NONE of 'em drawn all that well, which is why I'm telling but not showing...), I put into pictures a typical day at the Hembeck hacienda, accompanied by the requisite time cues: get up, feed the cats, read some comics, eat lunch, go grocery shopping, hit the drawing board, cook dinner, welcome Lynn home, eat dinner, watch "All My Children", watch the Mets game, take a shower, listen to some music, do some more drawing, catch David Letterman, read one last comic, and finally, go to bed. Well, it just goes to prove the old axiom--there's always SOMEBODY who'll single out something--be it a book, a movie, a song, or even one of my most mediocre strips--as their own personal favorite, and so I dashed off a note to tell my new friend this, thanking him for finally justifying the existence of a MARVEL AGE episode I'd long felt sorta sheepish about. Seems as if he was SUCH a devoted fan, and he dug that strip so totally that, back when he was nine or ten, one long ago summer day (an oppressively boring one, I'm wagering), he convinced his mom to let him follow the blueprint I'd provided and actually mirrored Cartoon Fred's mundane day!! Now folks, THAT'S a fan! Well, a week or so back, I received a short email from a fellow named Jonny Metro professing to be a long-time fan and asking for my autograph. Every so often I get a request like this, and if it seems legit--occasionally, you get the impression that they really don't know who you are and just plucked your name off of some database--I'll stick an index card with my John Hancock (and my Fred-head, natch) into an envelope, and send it off. Usually that's the end of it. Maybe I'll get a quick thanks, but little more. Well, today I got my thanks from Mr. Metro--and a whole lot more. 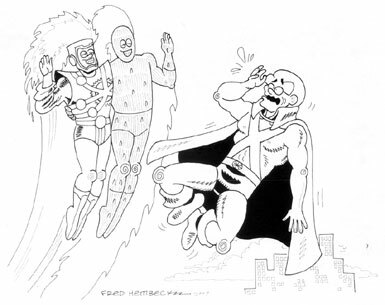 Seems he has a blog (seems EVERYONE has a blog, but that's besides the point...), and he wrote up a short appreciation of the nigh infamous FRED HEMBECK DESTROYS THE MARVEL UNIVERSE. But his piece turned out to be so much more than merely a good review. Thanks, Jonny--you made MY day! Take Arnim Zola there. Pictured above is the final page of CAPTAIN AMERICA #208, which also served as the debut of one of Jack Kirby's wackiest creation (and friends, that's REALLY saying something!) . John Lancaster, collector of all things Arnim, enlisted me to offer my own twisted version on this already twisted character! 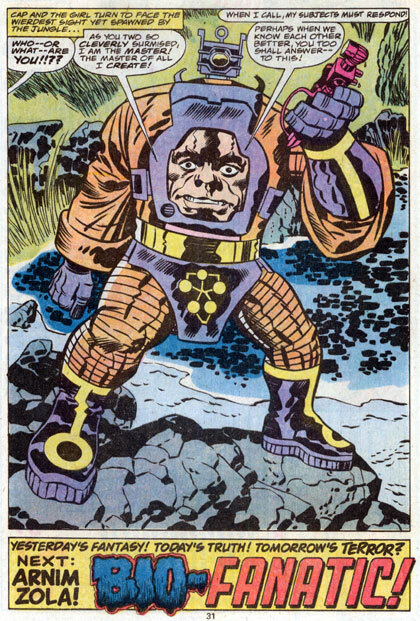 You can see a Hembeckized Arnim Zola by following this link (original misspelling of 'wierdest" included) ! 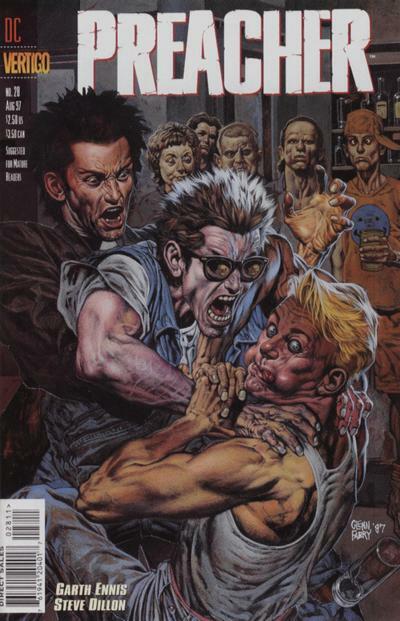 Then there's PREACHER #28. I truly enjoyed getting a crack at reinterpreting one of the masterful covers Glenn Fabry did for my all-time favorite Vertigo series. Mostly, though, I relished the challenge of morphing a painting into a line drawing--mandatory squiggles naturally included. Once again my patron was a man on a mission, and I highly recommend you take a gander at Michael DeLeRee's Preacher gallery--I was especially amused by the illo turning the Simpsons into the Preacher cast! 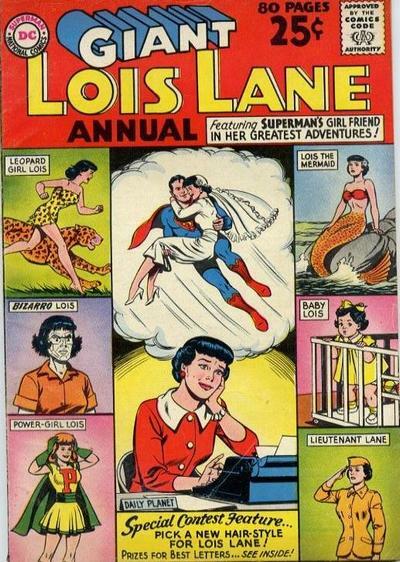 LANA LANG ANNUAL #1 can be viewed by going here. Well, I hope some of you found that little artistic survey entertaining. And those of you so inclined to purchase a commission from me (details here), perhaps these examples may inspire some requests a bit out of the ordinary! If you have a clever switcheroo notion you'd like to see done, drop me a line! If there's a particular character you specialize in collecting, keep me in mind! (And believe it or not, I've NEVER drawn Modok! After Arnim Zola, he'd seem to be a natural, don'tcha think?...). And if there's some brush strokes you'd like to see turned into line work, hey, think of me! You ever stop for a moment and wonder, gee, just exactly WHERE did he come from, what got him started, what inspired him? Yeah, I know--it's a little difficult for me to comprehend, too. But apparently it's true, Several years ago, I was contacted by one of his biggest fans and told the tale of "The Revengers", a comic done by Rob while he was still in junior high school with an extremely low run print run, a comic done in a style that could only be described as a (ahem) loving homage to yours truly! And if you don't believe me (and hey, I certainly wouldn't blame you if you didn't! ), scroll midway down into this weeks installment of Rich Johnson's "Lying In The Gutters", and you'll find all the evidence you'll need! And yeah, in what had to be one of the oddest commissions I've ever taken on, I actually did a redo of Rob's earnest attempt to ape my style! Talk about your snake eating its own tail! Y'know, I only ever met Rob once. 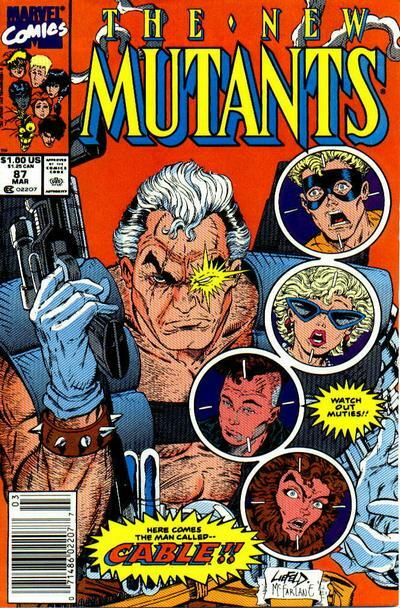 It was at a big NY Con back around the beginning of the nineties, not all that long before Image came into existence, but while he, Todd McFarlane, and Erik Larsen (both of whom I also had my lone personal encounters with during that selfsame event) all were at their absolute peak of Marvel-generated popularity. Rob was surrounded by his many, many fans, and I was only able to sneak back behind his table to say a quick "hi" with the assistance of one of the con's organizers. At the time, I simply assumed that our brief exchange was due to the crush of the crowd and the demands they were making on Liefeld's time. In retrospect, though, it's more likely that Rob was rendered near speechless when suddenly finding himself in the presence of one of his artistic gods! Either that, or a cold shudder went up his spine at the mere sight of me, thinking, "Whew, am I ever glad I didn't continue on THAT path! And I got me a million good reasons why!..." In the meantime, I'll try and go figure out who ELSE I may've inadvertently inspired! (True story--back when we moved 11 years ago, I came across several boxes of correspondence I'd received during my earliest days of doing "Dateline:@#%%" for THE BUYER'S GUIDE, and I stumbled across a fan letter from a young Chris Ware! Yeah, that's right--the fellow who would later go on to win all sorts of awards for his ACME NOVELTY LIBRARY series! Unfortunately, the note was misplaced during the move, but I know it's around here SOMEWHERE--really! 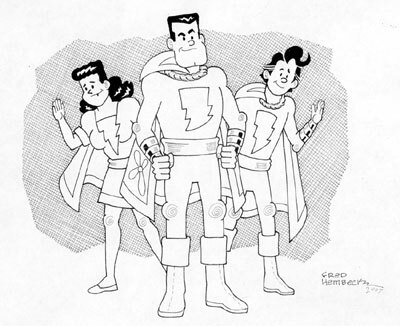 Yeah, you know the drill--"With one magic word..." (actually, in Junior's case, two...)--ladies and gents, I give you The Marvel Family!! Y'know, there are an awful lotta comics websites out there (and a ahole lotta good ones, too--have you checked out Richard Marcej's The Baboon Bellows lately? Plenty of fun stuff to be found there for the pop culture enthusiast , lemme tell ya!... ), and when it comes to news, reviews, and even snarky comments about goofy old Mort Weisinger comics, well, I'll admit it, they've all pretty much got me beat. Good idea, wouldn't you say, J'onn J'onnz? Talk about walking on air when you're in love! Mr. and Mrs. 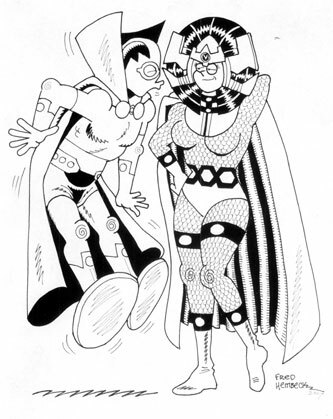 Miracle (aka Scott Free and Big Barda), they're just so darn cute! Except, the story goes that creator Jack Kirby modeled the super escape artist after the legendary Jim Steranko, and Barda after his own beloved wife, Roz--gee, I sure hope MRS. Steranko wasn't the jealous type!.. J'onn J'onnz, Firestorm and Johnny Storm!! And--uh huh--here's comes the by now unavoidable sales pitch. These are each currently for sale over on eBay, so if any (or all) of the above catch your fancy, head on over and make a bid! And should you feel moved to do so, well, as Granpa McCoy was known to say, "Much obliged!" My admiration for Mr. Ditko has long been virtually boundless, in large part due to the work included in this very volume. Every single illustration drips atmosphere! Every single panel screams drama! 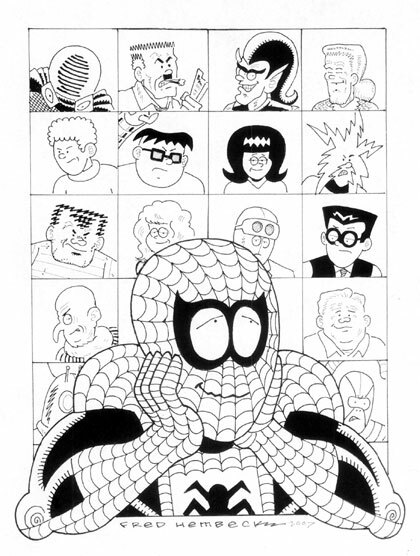 Every single drawing of Spider-Man is iconic! Look, it WAS his next to last issue--these things happen, y'know? 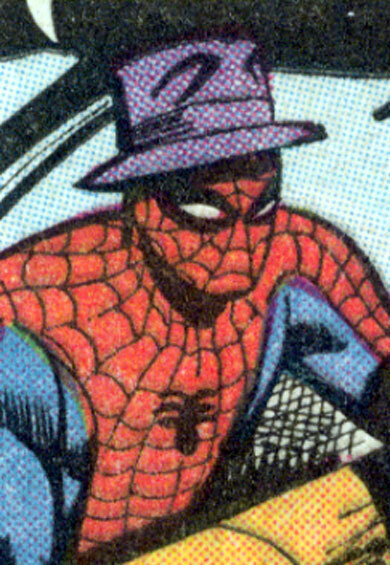 HAT'S OFF TO STEVE DITKO!! So I'm given to understand that Jerry apparently offended some folks the other night? I managed to watch the first four hours and the last two live--as well as a few Jerry-free hours Monday morning--but as fate would have it, I just missed out on Jerry being, well, Jerry. Most interestingly to me, Jerry announced, during the waning moments of hour 19 that there were plans afoot to mount his recent tome, "Dean and Me: A Love Story" as a Broadway musical--and with no sense of irony, he then went on to add that it'd be coming to The Great White Way right around the same time as the all-singing, all-dancing version of "The Nutty Professor"! 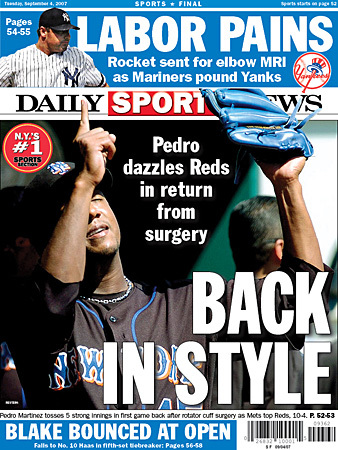 Eleven months after shoulder surgery, the 35 year old pitcher took to the mound for the first time this season on Monday, and garnered a win for the Mets. Quite a feat, given the circumstances--no one, they say, ever comes back from that particular operation in less than a year. Nice job, fella. Good luck Sunday at Shea. Yesterday was her very last first day of high school--and tomorrow we'll attend our very last "Welcome Back" PDS picnic, and Sunday will likely be the very last "Community Day" for the three of us, as she'll probably be away at college this time next year. Geez, I can still vividly recall her getting off the bus following her very first day in first grade shortly after we moved here eleven years ago! Hey LAAAAADDDY! It's Jerry Lewis! 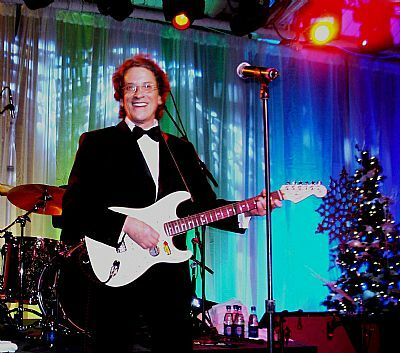 And, yup, it's time once again for the telethon! 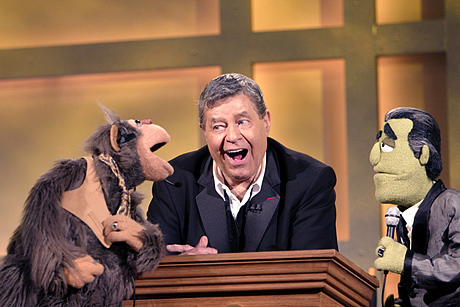 The Jerry Lewis MDA Telethon is the ONLY once-a-year telecast I've come to literally consider a seasonal turning point. And why not? Within days of that final tote being proudly read by the comic legend, kids are back in school, and summer is, for all intents and purposes, over. For that reason alone, I've found that watching this long-running annual event can be a particularly melancholic experience. Seeing this turn up in the TV listings sorta says, "Well, you've had your fun for THIS year, buddy--vacation time is over. 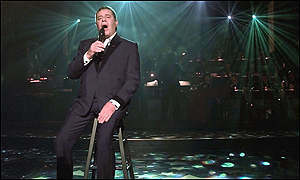 Jerry's back...."
I ask you, what OTHER show has such an impact from a mere single airing? The Super Bowl? Well, maybe, if you're a football fan (I'm not), but c'mon--can you watch The Super Bowl for hours and hours, go to bed, get yourself a good nights sleep, get up in the morning, and then KEEP watching The Super Bowl? Uh uh--I didn't think so. But for nearly 21 straight hours at the dawning of each and every September, you can watch Jerry! And c'mon, let's not forget such stalwarts as Norm, Jan and Ed! Without their invaluable assistance--along with those incessant Casey Kasem PSAs and the aptly named Bob Zany's inevitable stint keeping the host's chair warm during the wee, wee hours--poor Jerry may've totally exhausted himself decades ago. But thanks to Crosby, Karrl, and McMahon, we still have our Labor Day Lewis! Y'know, I can't even recall the last time I missed watching at least some of the annual broadcast--I know that I haven't during daughter Julie's seventeen years, that's for certain. In fact, one of my most vivid memories of tiny newborn Julie was back on the third of September (in the prophetic words of The Temptations, "that day I'll ALWAYS remember"),1990. After some rough going making her way into this world, nine day old Julie was finally being released from the hospital, and as we went to check her out to take her home with us for the first time, what do you think was playing on the television set right across from the admittance desk? C'mon--what else? 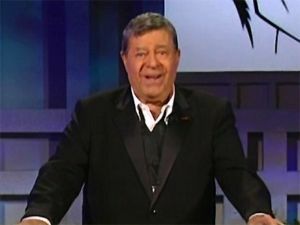 The Jerry Lewis Telethon! Which maybe I was, under the circumstances, paying a little bit TOO close attention to. I remember one of the nurses giving me a quizzical look, as if to say, "Hey pal, you've got a brand new kid here--don't get your priorities mixed up!" And now, that time has come around once again. But enough dark thoughts. I have THIS years extravaganza to relish! From nine tonight right on through to the host's annual choked up performance of "You'll Never Walk Alone" when Jerry wraps up his portion of the show around 5;45 the next afternoon (usually also right around the time Lynn serves dinner--watching the MDA Telethon is NOT a family affair in the Hembeck household, sad to say...), I'll catch as much as I humanly can--and maybe even tape a little of the overnight hours to savor later.